I am honored and proud to be chosen as SAM for July. My name is Dee Richardson. I live in Ancaster, Ontario, Canada, about forty miles west of Toronto. I have been married for forty five years to my husband Dennis. We have a daughter living in New Brunswick and working for The Mozilla Foundation on the Firefox browser. Our son is local and works in retail. Both are unmarried. However I am Grandma to my daughter’s rescued Grey Hound. I am a retired elementary school teacher. I loved my job and still miss the children. I have been stamping for about six years. It all started when my good friend, who is a real estate agent, suggested that I should make each of my children scrap books if I didn’t want the photos to go in a dumpster in the future. One thing led to another and I evolved into a card maker. 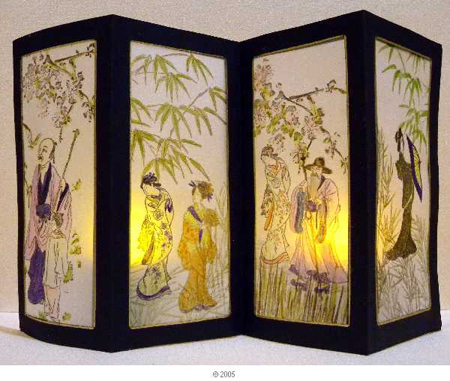 Asian themes are my favorite, followed closely by anything vintage, especially children. I guess I would say Polished Stone and other techniques using alcohol inks. I love creating my own backgrounds. I guess I qualify as a “Technique Junkie”. I seem to collect them. My favorite stamp companies are Hearts In Touch , Art Neko and About Art Accents. I am drawn to images of Geisha having read Memoirs of a Geisha four times. I also love images of pandas, bamboo and Asian scenes, including architecture. And of course, there are cranes, children, people and oh yes, DRAGONS! I wasn’t quite sure what was meant by “stamping accessory” but sought guidance. Thanks Kavi. I really like my rounded corner punch and my Krylon pens for edging. I also enjoy my glass cutting mat .I was always forgetting to not use the heat gun without some protection for the self healing mat , THEY WARP!. After ruining a few, I went with the glass. Hint-don’t use a strong cleaner on the back of a glass mat as the guide lines clean off with the dirt. I like Earth tones, neutrals and all those yummy jewel tones . Not much into pastels. I like peel off sparkly dots and strips. I am starting to use more rub ons. I would find it very difficult to go without an Xacto knife with a sharp blade and a steel straight edge ruler. Take time, schedule it, to just play and experiment with the products you have. Think “what if” and then try it. Put your work out there. Add as an attachment to emails. Join swaps. They are a great learning resource. Join challenges and contests. Never doubt the worthiness of your art. it is part of you, so it is beautiful. The more you participate, the more you learn and grow. JUST DO IT! I am fascinated by the history and culture. OSA provides resources and information through fellow members. If I don’t know, I ask. I have always received excellent help and answers. I have heard that China Town in San Francisco is a good spot. I belong to ORSA, Ontario Rubber Stamp Artists. It is available to Ontario residents only. I hostess a monthly technique swap for members of this group. Other groups are ATC Swapping, Inky fun Stampers, and Hearts in Touch. I belong to a few more, but am not very active. I enjoy Rubber Stamp Madness and Somerset Studio. Of course VSN (Vamp Stamp News). Some of the Australian magazines are great if they can be found. I love to garden, read, cook and knit. 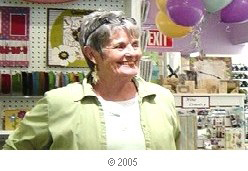 I detest sewing. .
Inspiration comes through new techniques, the work of others, new products and online resources. Just being in my craft space with all my “stuff” is inspiration. As a teen, I took some oil painting lessons from a local artist. I was far more interested in the cute boy in the class than painting. I also took art in high school. I really enjoyed it! I have used lots of stuff not meant for stamping. A few examples would be tea and coffee, sea salt, sand, bubble wrap, netting from onion bags, elastic bands, tin foil, plastic wrap, and more. I enjoy Technique Junkies and Split Coast. Trish Bailey has lots or techs. On each panel, measure in ½ inch from all four sides. Use Xacto knife and ruler to cut out the four small panels. Do this with both pieces of black card stock. Make sure it is completely dry. TURN THE FIRST VELLUM PANEL OVER AND COLOR THE STAMPED IMAGES ON THE BACK. I used Tombow tape runner. When all four vellum panels are adhered, adhere second black card stock frame to the back of the vellum panels. Take care to make sure they line up ,or the black will show through the vellum. Accordian fold the finished screen. Use a battery powered tea light candle to illuminate from behind.